Dos Chinos on Dos Wheels: Check out my new wheels! No, the bike's not blocking the view of my new ride, the bike is my new ride! 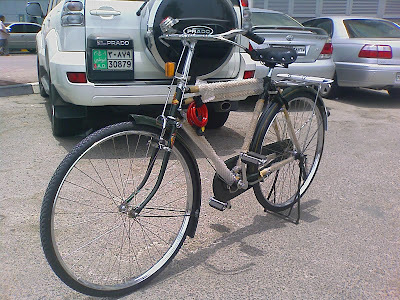 It's a Pakistani bike! Not as sturdy as the Dutch counterparts, but then again, this was quite a bit cheaper! Congrats on the new wheels. Love it. Looks exactly like the one I used to ride in India. Btw, passenger/s can be seated either on the rear carrier or on the cross-bar in front (or on both :) - Indian style. Happy riding Q.
I'm impressed. Riding a bycicle in that heat?, that's what we call a "bikkel". Cheers, Peer "won't drive a bike if his life depended on it"